Thermo Group boilers are efficient heat generating units for a main heating network using a hydraulic system. Boilers up to 9 kW are compatible with single-phase and three-phase. As well as the power of 12 kW or 15 kW three-phase, they generally settle in houses or apartments. 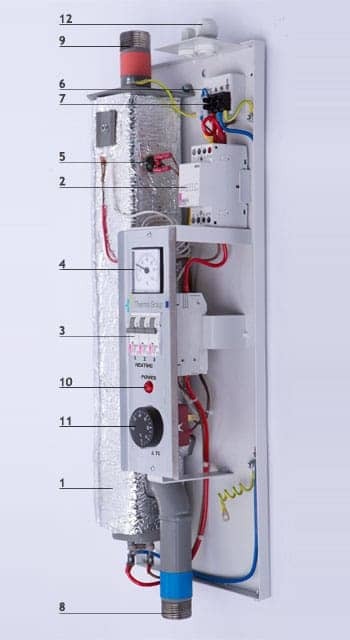 The 18 kW and 24 kW three-phase powers are intended for large houses, buildings or communities. It is possible to keep the existing heating system and to realize a multi-energy network by adding the boiler. If necessary, they can be mounted in parallel via a buffer tank. 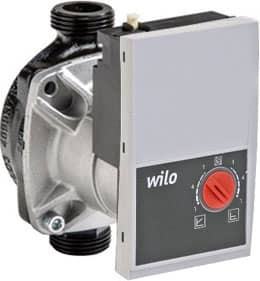 Its connection facilitates the replacement of an old wall-mounted boiler with fuel oil, propane, natural gas, wood or new construction with new standards. * All our prices including taxes, and free shipping to most of all european countries. For details, please register for a free account. In its simplified version, the mini electric boiler does not include a circulation pump or security group. It is necessary to install them as described in the example of an operational diagram of a heating network. 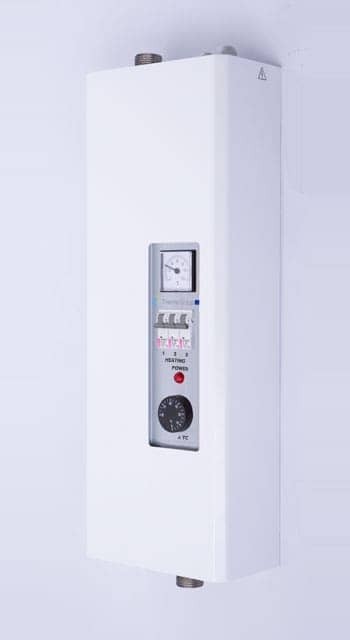 Arrival heating cold water 1"
Starting hot water heating 1"
The "Mini Europe +" electric boiler incorporates a high-performance WILO Yonos Para energy class A circulator that facilitates the distribution of the water pressure on the heating system while ensuring a low consumption. * All our prices are tax included, and free shipping to most of all european countries. For details, please register for a free account. Starting hot water heating ¾"
Arrival heating cold water ¾"
Do you want to install an electric boiler 6 - 24 kW at the best price ? SPECIAL OFFER TODAY 2019/04/26: A VALID QUOTE REQUEST GIVES YOU A DISCOUNT CODE OF 100 € ON YOUR ORDER! We need to contact you to communicate the quote! Where is located your installation project? THERMO GROUP is a European manufacturer of "Mini Europe" electric boilers up to 24 kW with small dimensions, embodying a simple technology for domestic or collective heating circuits. It is the subsidiary of an industrial company of heating equipment up to 1000 kW, founded in 1994. Our European manufacture guarantees a quality product, tested electrically and hydraulically according to a strict protocol meeting the standard of production and management ISO 9001. Our philosophy is the manufacture of durable products without proprietary electronics, designed to work decades without costly repair. A study by an agency for the environment and energy management shows that the consumer consents to pay systematically to fix a product if that price is less than one third of the brand new product. The cost of heating is an increasing place in the housing budget. Coupled with the cost of producing hot water, they represent on average 2/3 of the energy costs of the home. Improving an obsolete electric heating system saves money and improves home comfort. The THERMO GROUP electric boiler is adaptable to many other hot water production solutions or in addition to a boiler already connected to the heating network. Oil, gas and fossil fuels are to be avoided, they will become increasingly scarce and expensive and pollute the planet creating a catastrophic imbalance that has already begun. Electric power is the only green and alternative energy in the future for your home or your car because it is easily produced, for example with solar photovoltaic panels or wind turbines. Economic : It allows a considerable saving due to its low cost of acquisition and installation, compared to a fuel oil boiler or a propane gas butane solution. Innovative : The system keeps its power and efficiency of at least 95% because of the good insulation of its components, whatever the outside temperature. Simplicity : Annual maintenance is not mandatory, reliability guaranteed and its troubleshooting is of extreme simplicity. Optimization : Aesthetic, it is one of the most compact systems that it exists. Its small dimensions make it easy to install. "Mini Europe" does not require any annual inspection, unlike boilers fueled by gaseous, liquid, solid fuels or all heat pumps containing more than 2 kg of refrigerant. This information is suitable for France and most of all western european countries. 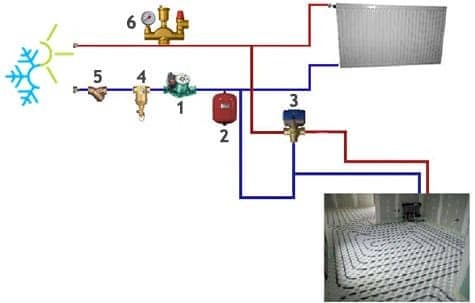 In the case where the high-temperature radiators and the low-temperature heating floor are coupled, the boiler must send high temperature to the heating circuit. LT : low temperature 35°C / 40°C by heating floor, radiators. The heating capacity is higher in floor heating due to the accumulation of heat in the tile. * Non-contractual indicative table which could differ according to the actual insulation, the good functioning of the heat emitters and the general condition of the heating system. Thermo Group can not be held responsible for the power selected by the customer. The efficiency (%) is the ratio between the actual efficiency of the machine and the maximum theoretical efficiency that can be expected of it. "Mini Europe" is one of the best returns on the market, due to the low loss of its circuit because of the good insulation of its hydraulic components. It is achieved automatically by transforming the electrical energy into heat energy, a stabilized rated power limits the energy consumption to strictly necessary. The efficiency is reached automatically and continuously because of the conversion of electrical energy into heat energy. Cold water arrives at the bottom of the boiler, its temperature increases as it passes through the contact of the electric heater up to the high point. When the requested setpoint is reached, the boiler switches off and then resets itself when the temperature of the heating system requires additional energy. The nominal power is reached almost immediately without unnecessary energy consumption, limiting it to the strictly necessary. Electricity is a competitive energy. With an efficiency close to 100% of which you pay the bill after consumption with no storage or availability problem, uncontrolled price inflation. It is an abundant energy for the future, delivered at home. Laws prohibit the disconnection of electricity and if a power failure occurs, oil and gas heaters do not work either. Electrical bills are spread over the year with no money advance. 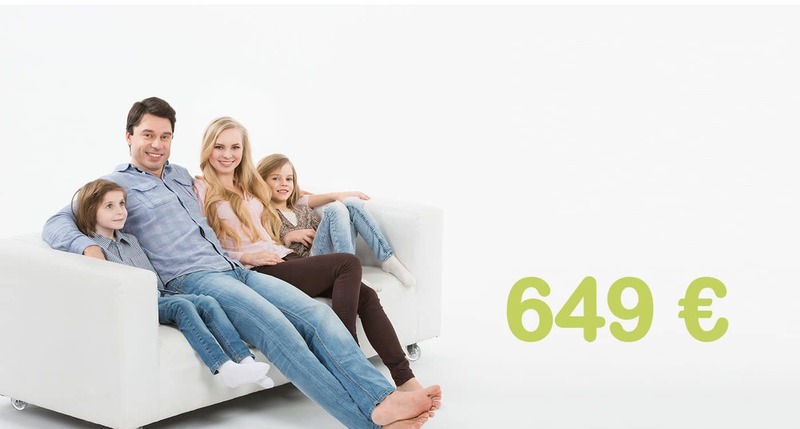 A multitude of good reasons justify the growing interest of the Europeans for the choice of electric heating. Modular because no problem of transformation or enlargement of the house. Minimization work has been reduced to a minimum, since the unit simply comes as a substitute for your old boiler, it takes up very little space, so no square meters are lost. It can be coupled with a solar system such as photovoltaic panels or a wind turbine. A precise and long life concept. "Mini Europe" boiler is suitable for all applications. Simple and fast installation in new or renovated. It is designed for small or large houses, old or new buildings, apartments, communal / collective professional / livestock buildings, greenhouses, communal or sports halls. It is of new generation, economic and ecological to high, medium or low temperature. It heats up as much as you like whatever the outside temperature as it can reach a boiler output temperature up to 70 °. Low noise power, no compressor, no fan (unlike an Air / Air heat pump operating from 60 to 75 dB and approximately 45 to 55 dB for an Air / Water heat pump). No installation of hot air distribution system unlike Air / Air heat pumps. Wood stove, charcoal or fuel oil: significant loss of heat at the combustion site and in the flue. Obligation of a call of cold air by the ground for the safety and the maintenance of a breathing air. Regulation almost impossible. Electric convectors: vertical heat diffusion, high air stirring and cold feet sensation, difficult regulation and wall turn black. With the "Mini Europe" boiler, there is no additional electrical installation in the living rooms, unlike the installation required for electric heating by convectors or heat storage with the specific power supply of these devices. A heating system whose inspection is also reduced, almost free. Extreme reliability, small footprint, ease of installation, smoke-free, Co²-free. Operates without oil, gas, wood, refrigerant gas. Electric heating is a clean heating system that does not stir up air. Safe and simple system for any user. Operates without untimely consumption of oxygen, does not dry the air and preserves hygrometry. Clean and safe air guaranteed. The boiler is not a heat pump, there is no moving part and no refrigerant either (in the area of greenhouse gases, the refrigerants used in the heat pumps are up to 15,000 times more polluting than CO²). The performances of the "Mini Europe" boiler are identical, regardless of the outside temperature, even very strongly negative. The "COP" of the indicated heat pumps are measured at + 7 ° and an electrical resistance takes over in case of negative temperature. This means that by -20 ° constant the electric heating will always have a constant consumption, which is not the case of an Air / Air heat pump that needs this electrical resistance before such a temperature. It does not require any additionnal heating boiler, chimney, casing so no sweeping and required inspection. It requires only one electricity subscription, no additional connection costs like for gas. No special network, no connection fees or additional subscription charges (gas, etc. ), special fittings such as retention pit (oil), special column (gas, etc. ), shelter (wood), or corner occupied (propane), smoke extraction chimney, sweeping, energy storage. Heat pumps often require the installation of a buffer tank, in particular because of the risk of frost in the outdoor unit in winter and in order to maintain a sufficient reserve of energy. No external earthwork or drilling for the installation of the catchment network compared to the heat pumps in geothermal or Air / Water heat pump. All these arguments justify the choice to buy a boiler at the best price because it is sufficient if well dimensioned. Many defective heater pumps, even before they have become profitable, are transformed into the installation of a "Mini Europe" electric boiler! OUR PRIORITY, IS YOUR SATISFACTION. 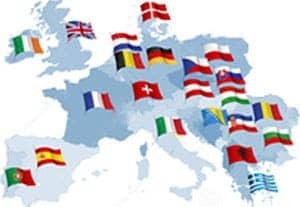 By ordering online from our website, you get the best price for our electric boilers manufactured in Europe without any intermediary like market place or resellers. To most of all european countries including UK and Ireland. A tracking number is transmitted in order to follow the tracking of the package. Our online ordering process is easy and efficient, just like our electric boilers. Create a customer account for free to buy at any time. By direct chat and email to answer you in the shortest time possible. Whatever your question, do not hesitate to contact our customer service! Where did you know us? If you have any questions, please contact us using the "Leave a message" window at the bottom right of this page or by using the "Email Contact Form". Available Monday - Friday from 10 am to 5 pm (GMT +01:00). Thermogroup.com registered since 2005, is the official distribution site for THERMO GROUP boilers. Electric boiler THERMO GROUP: purchase of heating, specialist in cheap electric boiler, ask for a quote of electric boiler, a cheap price on electric boiler for the individuals or the professionals. The THERMO GROUP electric boiler ensures a controlled consumption and a systematic repair in the event of an out-of-warranty malfunction without compulsory maintenance because heating must remain profitable over the long term; In comparison with traditional heat pump heaters, gas boiler (natural, propane, butane), fuel oil boiler, wood pellets, convectors. Whatever the surface to be heated, our boilers adapt themselves to renovation as for a new construction. Buy today from our online shop to get the best prices available on easy and efficient electrical boilers !